The fall of Alexander the Great’s vast empire left a power vacuum in many of the territories he had conquered. Smaller kingdoms rose and absorbed citizens into their ranks, commanding new armies and new territories in fresh bids for power. One of these baby kingdoms was the Commagene, in modern day Turkey. Commagene was founded in the 2nd century B.C.E., and lived a tumultuous existence. Bouncing between kings and empires, Commagene was sporadically independent for only 200 years before being subsumed by the powerful Roman Empire in the 1st century C.E. Interestingly enough, this short-lived kingdom’s most notable architectural legacies were burial mounds and funeral statuary. 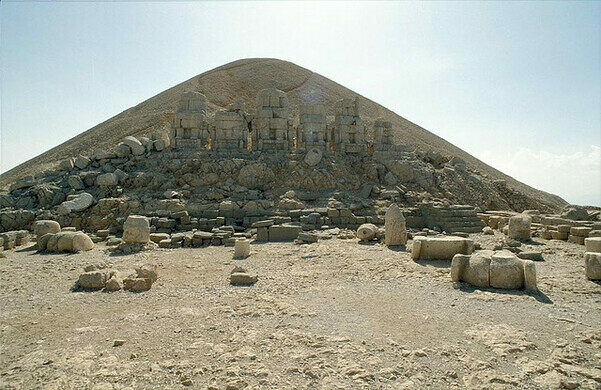 The most prominent of these relics, is Nemrut Dagi, a massive tumulus and mausoleum dedicated to the most famous king of the Commagene, Antiochus I Theos of Commagene. 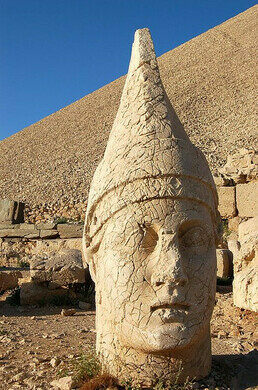 Antiochus ruled from during the middle of the 1st century B.C.E., and his rule is commemorated in statuary and sandstone relief on top of Mount Nemrut. The mountain towers 2000 meters over the surrounding landscape. A drive up the mountain from the nearby towns at the base give incredible views the whole way up. Once at the apex, the heads of giant statues litter the side of the hill, showing great detail in depicting the Hellenistic-Age kings of Commagene. The sheer amount of statuary clearly indicates the importance of the area, and the immense beauty of the sanctuary. 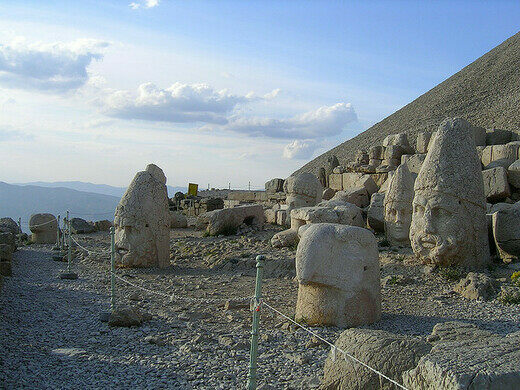 Although it is supposed that Nemrut Dagi holds the remains of Antiochus, exploration by archeologists in the mid 20th century, yielded no results in finding his burial chamber. 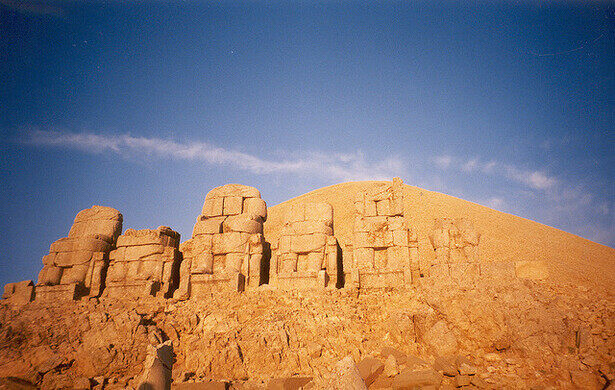 Despite the lack of evidence, the surrounding statues tell a story of the Kingdom of Commagene, and provide details into an oft-forgotten ancient world. Along with the statues, the oldest-known work of art depicting a handshake is shown in a number of reliefs around the mound as well, adding an eerie pre-modern political element to the sanctuary. Climbing near the mount allows for spectacular views across the rocky and hilly landscape of this lost kingdom of Antiochus, and is now a UNESCO World Heritage Site. 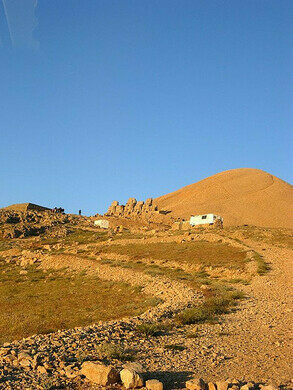 The ancient abodes are a testament to human ingenuity amid harsh climates.